On June 9, 1843 sixteen Baptists met at the James Fletcher Schoolhouse to organize a church. Joseph Haywood Eaton, who came to Murfreesboro as a midwife and nurse to Union University, was elected to serve as pastor. Eaton would later be named as president of Union University. The young church constructed its first house of worship in 1848 at the corner of South Spring and Sevier Streets. The building served its members well until it was confiscated by the Union Army and converted into a Federal hospital following the Battle of Stones River. The church erected its second building, which was located on East Main Street on the site now occupied by St. Paul's Episcopal Church. 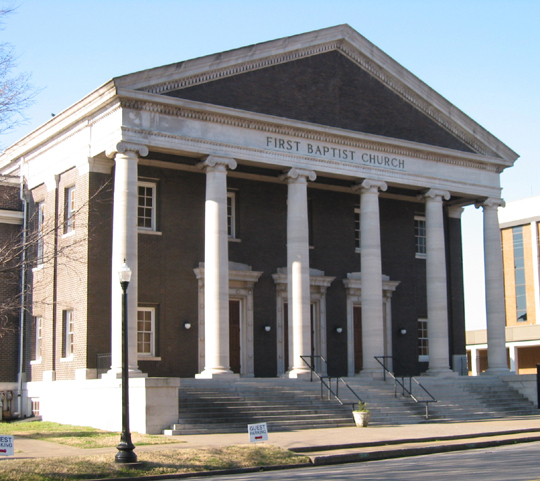 The Tennessee Baptist Convention was organized in this building on April 10, 1874. The church met at this location until 1919, when a fire destroyed the second of two buildings on the site. The present day sanctuary, located at 200 East Main Street, was constructed in 1920. At the suggestion of Austin Crouch, pastor, the new building features neo-classical architecture. During the modern era, the church grew rapidly. Under the leadership of Dr. Eugene Cotey, the church developed a full range of programs for all ages. The sanctuary was remodeled in 2002. 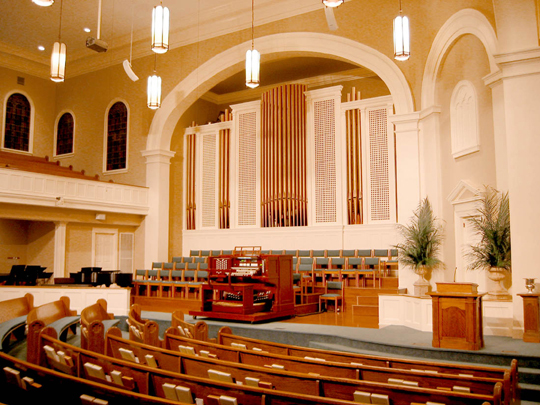 The organ of First Baptist Church, Murfreesboro, was installed in 1925. Mr. and Mrs. Andrew L. Todd donated the organ as a memorial to their son Aaron. 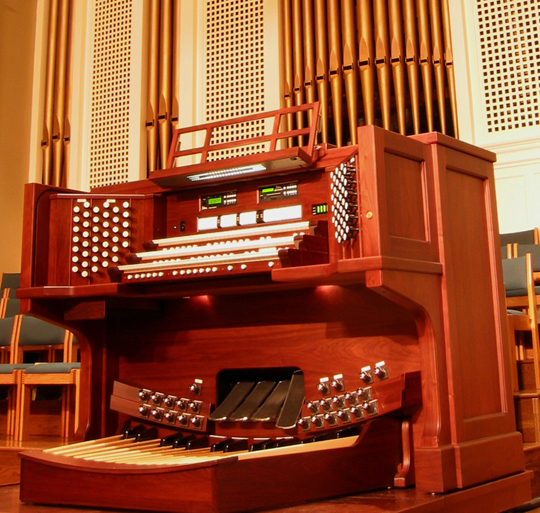 In 2003, Barger & Nix Organs of Chattanooga, Tennessee cleaned and rewired the pipe organ. Claude P. Street Piano Company of Madison, Tennessee provided a new Allen console with digital additions. The result is an instrument with tonal additions which blend and are in keeping with the style of the original Skinner.